I use a social media app, Foursquare, to check-in random places, mostly while I’m out and about dining or running errands. Every now and then, I reap the benefits of using said app by unlocking a special, and today was that day! I couldn’t eat it all! I might be sad that Spring hasn’t sprung, but this free dessert gave me just the pick-me-up I needed to finish out the rest of my work day! How are you on this Tasty Tuesday? This entry was posted in Lunch, Social Media, Winning. Bookmark the permalink. LOL! 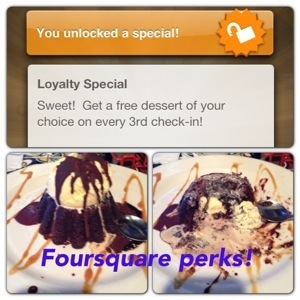 I use FourSquare for the same reason…the deals! Last week I checked into Red Lobster and got a deal during Lobsterfest. And I was way too happy about it!